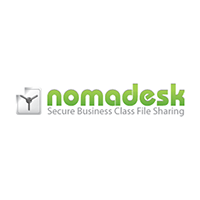 Nomadesk provides cloud-based file sharing, sending, and storing for businesses and enterprise-level clients. Nomadesk specializes in providing cloud storage with enhanced security and data sharing features. Nomadesk is focused on ensuring the security and integrity of data in the cloud. Security is maintained through a 256-bit local hard drive encryption through a privately-owned user-held password. Additionally, Nomadesk offers enhanced data protection in the event of theft or loss, such as remote wiping capabilities and location tracking. Edited file versions are available for up to 14 days while Nomadesk’s platform provides unlimited backups. The software eliminates the need to send large files through email by creating links to downloadable content. Administrators are also given the control to track of data access, downloads, and modifications. Large-scale companies have the additional option of making certain files on the cloud invisible to users, further reducing the threat of leakage or corruption. 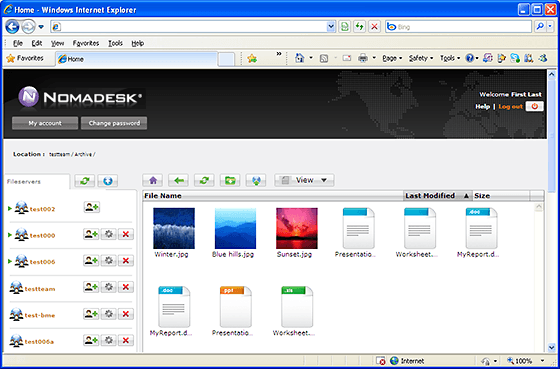 Nomadesk is compatible with Mac and Windows computers. Mobile access to files is available through Nomadesk’s apps for iPhone, iPad, Android, Windows Phone, and Blackberry. Nomadesk’s services are appealing to businesses that need a secure cloud storage solution which provides enhanced security, scalability, and productivity. Companies struggling to coordinate communication among teams, maintain consistent levels of security, and keep expenses down, benefit from implementing cloud storage and sharing solutions. Nomadesk has helped many businesses safeguard their sensitive data while improving communication speeds and cutting costs. Learn everything you need to know about Nomadesk. Our experts will reach out to you shortly.